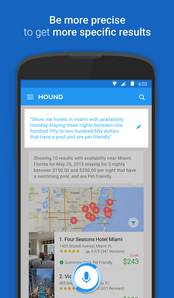 Hound App is a personal voice assistant by SoundHound Inc for Android and IOS coming soon so keep visiting for more updates. which we can call a competition to Apple's Siri and Microsoft Cortana. Hound App is basically a answering machine which was introduced in Google Play on June 2 this year says the description in Google Play Store - link given below. Let's take you through the Hound App, it is currently a BETA version for both Android and IOS. The only thing user has to do is just say "OK Hound" and start asking question no matter how quick, fast and long, Hound App will detect that and tell you the answer quickly by language understanding like and it understands exclusion like if you want to find a place for lunch, but since you don't want to eat Chinese, you can say "OK, Hound show me restaurants nearby, excluding Chinese places", quickly means really quickly. That's why SoundHound Inc. says "Say It, Get It". You can ask anything to Hound App starting from Weather, placing a phone call, navigation to stock market and even playing songs and interactive games. 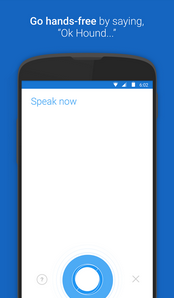 Hound App has a feature speech-to-meaning which make it the new way to search and do things faster without typing. Currently the App is available in US only (at this time), which may be extended to others also. The important thing to notice is that you need to request a code to start using the app. You can request an invite by log in into Sound Hound website link given below.